450 practice hours or 900 hours if revalidating as both nurse and midwife. 40 hours of continuing professional development. Of those, at least 20 hours must have included participatory learning. Five pieces of practice-related feedback. Health and character – fit and able to practise. 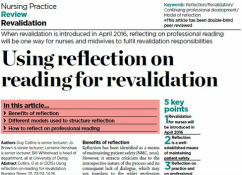 We provide dedicated print and electronic resources to help you keep up -to-date with best evidence based practice, reflective practice, mentoring, communication skills and much more. We can do literature searches for you on your chosen subjects to help you keep up -to-date with best practice. Journal clubs are educational meetings where individuals meet regularly to critically evaluate recent articles in the scientific literature. They have often been cited as a bridge between research and practice, as they encourage the application of research in clinical practice. Many more resources available with your NHS Athens Account.